We have nothing nice to say about the faucet that came with our current kitchen. It’s been a big pain in our kitchen’s behind since we moved in… maybe even before that! But alas, sometimes change is a good thing. Why? Because the kind folks at Pfister generously offered to let us take their new faucet for a spin. Yes, we finally got a new kitchen faucet! It really just wasn’t large enough for this double sink. The pull-out wasn’t smooth and was hard to place back inside and the chrome is a mess to deal with in terms of water spots and fingerprints… even for a clean freak! So, once we gracefully broke the news to our old faucet, we jerked uninstalled it and gave it a nice home in a box. See, the thing is, last week I shared news about our new house and we are moving soon… so the old faucet won’t be in the box for long. We are going to re-install it and take the new one with us. Yes, we really are… I can’t part with our new slate beauty! The switcheroo process only took about 15-20 minutes total and if you follow the directions, everything will go smoothly! My brother actually came over while Kevin was at work and installed it because I was just too excited to wait!! The new faucet is a dream. Literally. The wonderful people at Pfister sent me the Pasadena faucet in their newest finish… slate. The sleek slate finish is a perfect match for our kitchen! It’s really a unique finish between a bronze/brushed nickel and stainless steel. It’s absolutely beautiful! The great part about the finish is the fact that it is so versatile. It really could lend itself to being in a road range of designs styles. 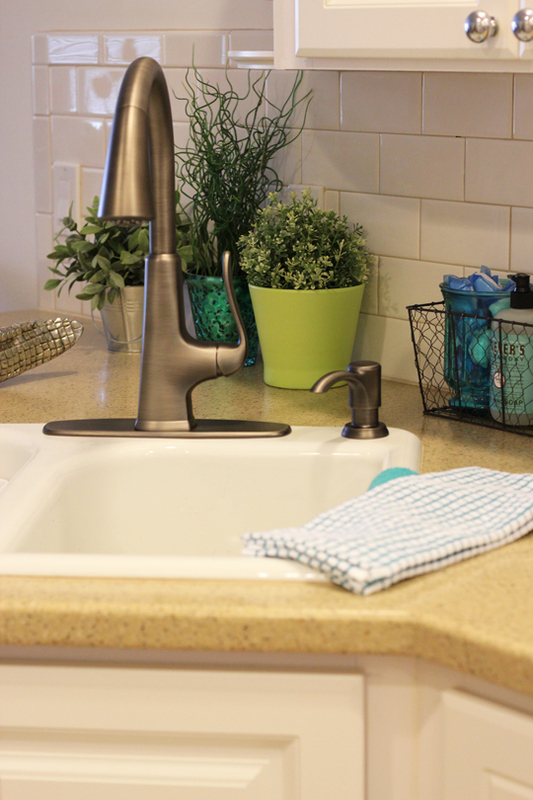 In our current home, it goes great with our white cabinets, white sink and white appliances. In our new home, we have plans of having slate or stainless appliances, and two-toned cabinets. It’s really going to be great and the faucet will be the icing on the new house cake! As far as function goes, one of the the things I love the most is the fact the pull down as a notch in it, which will help it stay in place overtime. 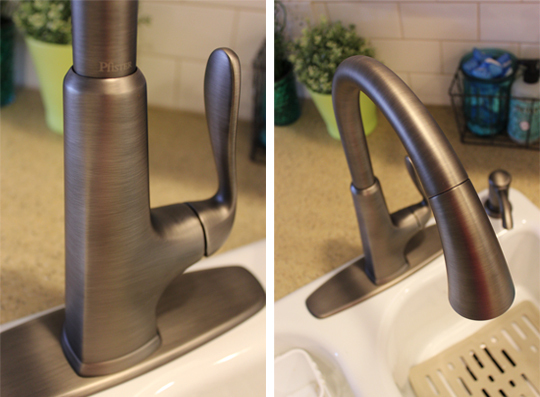 Kevin even mentioned the fact that this new faucet feels more durable because it seems a bit more hefty! The water flow is great on both settings and the pull down nozzle is really smooth and it goes right back in the hold really easy! What a change! The entire thing works like a charm and we absolutely love it from base to nozzle! 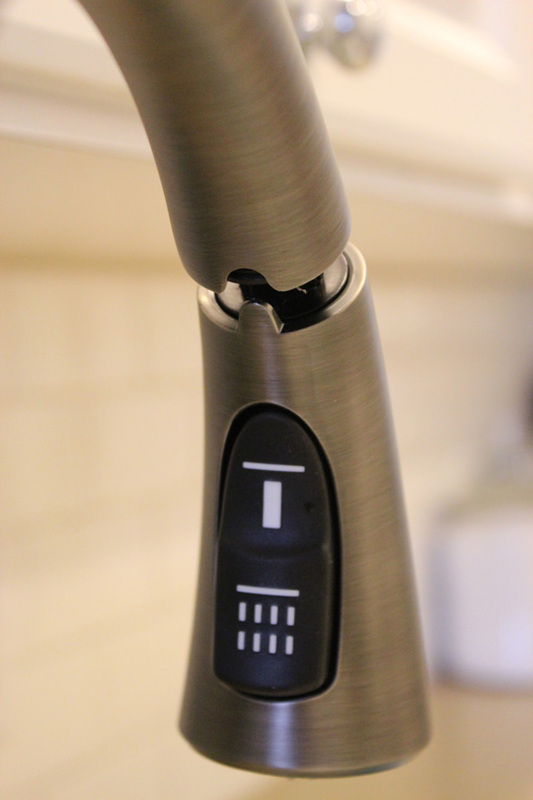 I love the notch the pull-down has to lock itself back into place upon returning the nozzle to its home. It came with a soap dispenser. The flow of water on the two settings is great. The scale is perfect for anyone who has a double sink (or a single one too). It really does reach both areas very well. 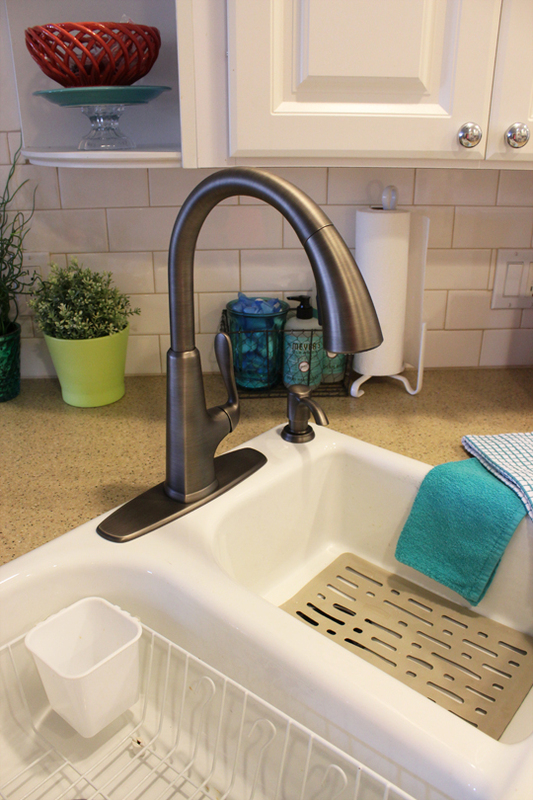 This faucet feels solid and very high-end… which to me translates into durable!! The finish is great because it hides all water spots & fingerprints…. What clean freak doesn’t love that? I didn’t get this beauty sooner. I talk about it so much I am sure people are getting annoyed with me. So… there it is. Our newly installed, soon to be un-installed and re-installed again in our new home faucet! Yay! A big thank you goes out to Pfister for contacting me and offering such a wonderful product to review. I absolutely love this faucet so much that I could reach straight across the wonderful world wide web and give you guys a virtual hug! 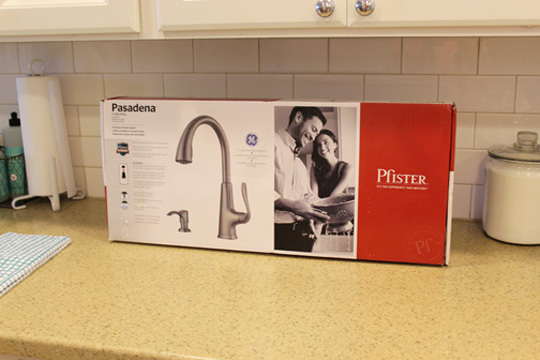 Disclosure: I was given the Pfister Pasadena faucet for a review. Please note, the content and opinions in this review are all mine. I love the product and have absolutely no ‘cons’ to give out! Lindsay, we’re so happy to hear the new faucet is working well for you and can’t wait to see it in its new permanent home. Thank you for the great feedback! Just purchased the same new faucet in slate. Love the new finish and it will be installed tomorrow. 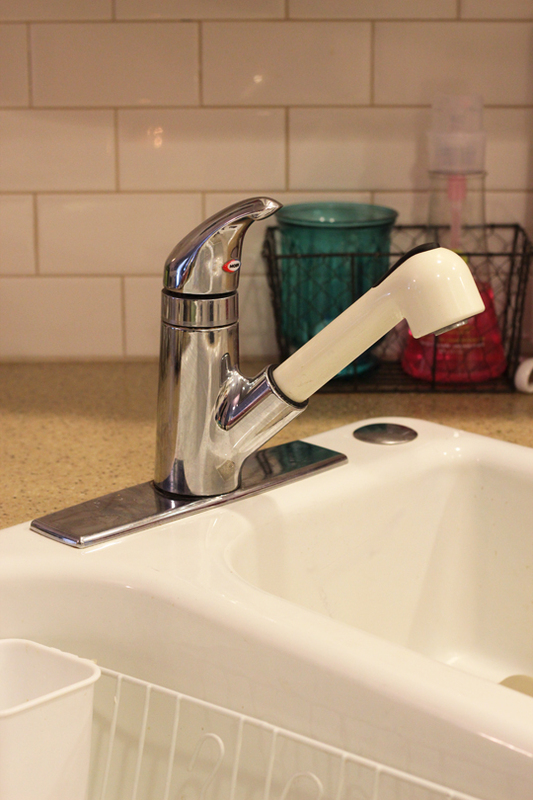 Question: What do we do about the reverse osmosis drinking water faucet which will be mounted right next to the new faucet. Can’t find one in slate so we are re-installing our old one, but the satin nickel looks awful next to the slate. Any suggestions about where can we get a drinking water faucet in the slate finish?